A Let L-410UVP-E20 operated by Summit Air (formerly known as Goma Air) was destroyed in an accident when it attempted to land on runway 06 at Lukla-Tenzing-Hillary Airport in Nepal. The aircraft operated on a cargo charter flight with 1680 kg cargo on board. It took off from Kathmandu at 07:44 UTC at flight 409, bound for Lukla. It was the 5th flight of the aircraft to Lukla and with the same set of crew. Lukla weather was cloudy, but visibility and ceiling was reported to be fine after an hour of heavy rain. On first contact flight 409 reported abeam Rumjatar descending out of 11300 ft at 08:10 UTC. Lukla Tower provided the latest weather at the airport, as well as enroute weather relayed by 9N-AGU, an AS350 helicopter that had departed Lukla for Kathmandu. Almost 4 minutes after the first contact, Tower informed flight 409 about the deteriorating weather. The right base leg was covered by lifting fog though there was no rain and the final approach area was still visible. Weather deteriorated further and Tower regularly updated the flight crew. About 30 seconds after flight 409 reported entering valley, Lukla Tower again informed about the latest status of the further deteriorating weather. Flight 409 then informed that they would come up to Bhatkeko Daada and then decide. The pilot also informed they could see some bright spots. While continuing approach, both cockpit crew sighted the runway at 9100 ft. That was 64 seconds before the impact. While continuing approach the aircraft deviated to the right by almost 15 degrees and erroneously descended too low to 8500 ft whereas threshold height is 8900 ft (on Kathmandu QNH, whereas per AIP it is 9200 ft). The flight crew attempted to climb and reach the threshold in a landing configuration. The aircraft pitched up to over 25°, the airspeed dropped and the aircraft stalled. Subsequently its left wing first hit a small tree and then impacted the sloping terrain 130 feet short of the runway. The captain and copilot both sustained fatal injuries. The Commission concludes that the probable cause of this accident was aircraft stall as a result of excessive drag created by sudden increase in angle of attack of the aircraft supplemented by low speed (below Vref) in an attempt to initiate immediate climb on a landing configuration (full flap and landing gear down) warranted by the critical situation of the final phase of flight. a. Critical terrain and rapidly deteriorating weather condition. c. Improper pilot response to stall warning including failure to advance power lever to maximum at appropriate time. d. Voilation of SOP by the ATS and Pilot as well. Launch Voluntary Reporting System as a part of the regular Aviation Safety Campaign emphasizing a non-punitive environment so that unsafe behavior of all aviation personnel including pilots, ATS personnel and maintenance staffs are brought into notice in time. Ensure that irrespective of the air traffic volume, assigned numbers of ATS personnel are manned in each shift of an ATS Unit (AFIS Tower). Depending upon the volume of air traffic, declare the minimum experience required for an ATS personnel in each shift at a particular station. In participation with the management of local hospital or health post close to the busy airport like Lukla, CAAN should initiate to upgrade their essential emergency medical facilities such as readiness of oxygen and ventilators. Rescue and Fire Service at Lukla Airport be strengthened with adequate manpower and equipment. Encourage on the spot inspection focusing on the critical safety areas including violation of SOP, proper CRM, CFIT, and ensure effective enforcement mechanism. Immediate action be initiated to set up and maintain essential MET equipment at Lukla Tower including the display of the real-time surface wind information of the runway threshold. Owing to the critical approach at Lukla immediate action be initiated for the possible extension of the runway threshold further to the South. Recognizing the critical situation that might arise as a result of sudden and rapid lifting of fog or cloud during final approach, it is recommended to install an appropriate visual aid or lighting system at Lukla runway. Continuous Coordination and monitoring with CAAN for the effective implementation of the safety recommendations issued by investigation commissions. Sufficient resources of finance, personnel and technical experts should be made available so that the investigation of an airplane accident can be performed effectively and timely. Increased stress and fatigue as a result of present air traffic congestion in TIA and its direct impact to the pilots’ proficiency also be taken into consideration while assigning flights to the flight crews and remedial action be initiated as necessary. 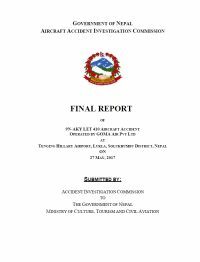 An independent and permanent body should be established for the aircraft accident and incident investigation purpose. The proposed Body should also be given the responsibility of monitoring the implementation of the Safety recommendations issued by Accident Investigation Commissions in the past and also act as the research body for the safety enhancement in the aviation sector. Review and strengthen Company Training Policy and Training Program of the flight crews emphasizing on airport based training incorporating unforeseen situations including effective response to the stall warning and pilot’s call out in simulator training. Review the Airline\'s Operation Manual and SOP incorporating stabilized point and committed point in the approach procedure of the Category C stall airfield so that a clear-cut guidance is available to the flight crews whether to continue or divert the flight. Develop a mechanism to monitor and ensure compliance to the provisions of VFR flights, SOP and other relevant safety directives by the flight crew. Review the block time of each sector providing enough ground time for each flight. GOMA air should enhance the flight dispatcher’s capability to enable them to fulfill their responsibilities as per the provision of company SOP. GOMA air should review and further strengthen the effective implementation of SMS process more importantly based on reporting system by crews. Distance from Kathmandu-Tribhuvan Airport to Lukla-Tenzing-Hillary Airport as the crow flies is 134 km (84 miles).